↑ अ आ इ ई उ ऊ ए ऐ Anglada-Escudé, G.; Amado, P. J.; Barnes, J.; Berdiñas, Z. M.; Butler, R. P.; Coleman, G. A. L.; de la Cueva, I.; Dreizler, S.; Endl, M.; Giesers, B.; Jeffers, S. V.; Jenkins, J. S.; Jones, H. R. A.; Kiraga, M.; Kürster, M.; López-González, M. J.; Marvin, C. J.; Morales, N.; Morin, J.; Nelson, R. P.; Ortiz, J. L.; Ofir, A.; Paardekooper, S.-J. ; Reiners, A.; Rodríguez, E.; Rodrίguez-López, C.; Sarmiento, L. F.; Strachan, J. P.; Tsapras, Y.; Tuomi, M.; Zechmeister, M. (25 August 2016). "A terrestrial planet candidate in a temperate orbit around Proxima Centauri" (PDF). Nature (अंग्रेज़ी में). 536 (7617): 437–440. आइ॰एस॰एस॰एन॰ 0028-0836. डीओआइ:10.1038/nature19106. ↑ Torres, C. A. O.; Quast, G. R.; Da Silva, L.; De La Reza, R.; Melo, C. H. F.; Sterzik, M. (December 2006). "Search for associations containing young stars (SACY). I. Sample and searching method". Astronomy and Astrophysics. 460 (3): 695–708. arXiv:astro-ph/0609258. डीओआइ:10.1051/0004-6361:20065602. बिबकोड:2006A&A...460..695T. ↑ अ आ Ségransan, D.; Kervella, P.; Forveille, T.; Queloz, D. (2003). "First radius measurements of very low mass stars with the VLTI". Astronomy and Astrophysics. 397 (3): L5–L8. arXiv:astro-ph/0211647. डीओआइ:10.1051/0004-6361:20021714. बिबकोड:2003A&A...397L...5S. ↑ Demory, B.-O. ; Ségransan, D.; Forveille, T.; Queloz, D.; Beuzit, J.-L.; Delfosse, X.; Di Folco, E.; Kervella, P.; Le Bouquin, J.-B. (October 2009). "Mass-radius relation of low and very low-mass stars revisited with the VLTI". Astronomy and Astrophysics. 505 (1): 205–215. arXiv:0906.0602. डीओआइ:10.1051/0004-6361/200911976. बिबकोड:2009A&A...505..205D. ↑ Schlaufman, K. C.; Laughlin, G. (September 2010). "A physically-motivated photometric calibration of M dwarf metallicity". Astronomy and Astrophysics. 519: A105. arXiv:1006.2850. डीओआइ:10.1051/0004-6361/201015016. बिबकोड:2010A&A...519A.105S. ↑ Kervella, Pierre; Thevenin, Frederic (15 March 2003). "A family portrait of the Alpha Centauri system: VLT interferometer studies the nearest stars". ESO. अभिगमन तिथि 5 September 2016. ↑ "Earth-like planet discovered orbiting sun's neighbor". CNN. 24 August 2016. अभिगमन तिथि 24 August 2016. A planet named Proxima b has been discovered orbiting the closest star to our sun. ↑ Davis, Nicola (24 August 2016). 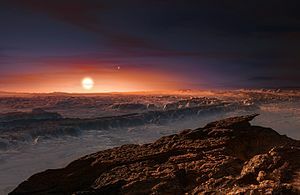 "Discovery of potentially Earth-like planet Proxima b raises hopes for life". द गार्डियन. अभिगमन तिथि 24 August 2016.